This is the first time I’ve offered space to a fellow Golden Age of Detection enthusiast to express his views, but I couldn’t resist this opportunity to bring this interesting material to a wider audience. Scott Ratner and I have gotten to know each other through a Facebook group devoted to Golden Age Detection (GAD) as fellow aficionados who share an interest and have gone deeply into it; our views are generally similar, but occasionally quite different. As it should be. Over time, I’ve come to respect his knowledge and analysis. I’ve known for a long time that Scott has a well-developed argument about the words “fair play” in the mystery context, and I’ve read short comments that interested me in hearing the full argument. Recently, in the course of a wide-ranging discussion on various GAD topics, Scott mentioned that he wanted to lay out this argument, but didn’t have anywhere to publish the result; I offered him the space below. To the best of my knowledge, there are no actual spoilers in the material below but it’s possible that you will learn more than you wish to about the plot and construction of various Golden Age mysteries by a number of authors. I’ll approve on Scott’s behalf any comment that seems relevant to the discussion (I draw the line at advertisements disguised as general praise) as fast as I can manage. Scott’s opinions are his own; I’ll comment or not as I see fit, and I didn’t edit his work (although I’m sure I reflexively corrected a typo or two; I can’t help it, it’s a disease). Thanks to Scott for his contribution — I hope you enjoy it and find it thought-provoking! “Fair play” is one of the key and most oft-cited principles of Golden Age and Puzzle Plot Detective Fiction. However, what is rarely examined is what that term really means, how it can be measured, and whether it even really exists in relation to the genre. First, it should be noted that “fairness” (and by this term, of course, I mean its definition relating to equitability, not lightness of hue, or or attractiveness) is always treated as an objective concept, and always considered in reference to a presumed exact and objective standard. Our language reflects this: we speak of “fairness” in binary, “lightswitch” terms– things are either “fair” or “unfair.” Moreover, the very fact that questions of fairness are disputed is evidence of its perceived objective status; subjective concepts cannot logically be disputed– one may argue the merits of a work, but a sincere subjective statement such as “I don’t like it” is inherently and inarguably true– the maker of the statement is the sole arbiter… he doesn’t like it! This is an intuitively understood notion, and its value is realized even by the small child. The child cries, “It’s unfair!”, and while he may be feeling merely that wants more of something or that he is unhappy with the treatment he is receiving, he appeals to this presumed objective standard, a threshold above which he is being treated fairly, and below which he is not (in many cases with children– and even with adults– this is equated with equal treatment: “you let Tommy do it!”). He realizes, even at this early age, that reference to this standard carries more persuasive weight than a mere expression of his desire; even if all the grownup responds with is “no, it’s not,” in disagreeing where the standard lies he is confirming the concept of the standard, and that it is a valid basis for decision. For many children, this is perhaps their earliest attempt to get their way via reason; realizing that while they can only express a desire, they can argue a point of fact (fair or unfair). The concept of “British Fair Play,” which is most probably the direct source of its use in detective fiction, may seem more casual and inexact, based on a personal, subjective sense of “gentlemanly” conduct– indeed, one might think I’m taking the whole matter too literally. But this use of the term is also integrally related to the others, and just as solidly tied to the concept of an objective standard. It is a reference to the very rigid and explicit rules of British sports (“it’s not Cricket!”) and military regulations, which are in turn presumably based on the “real,” objective standard of fairness. Thus, while our personal decision of what constitutes giving an enemy or opponent a “fair” or “sportsman’s” chance may be entirely intuitive, that intuition is presumably based on what is truly fair, independent of our belief. The point of all this is not that there is necessarily an exact, objective standard of fairness (I don’t really know if there is), but rather that the concept is always treated as such, and that every use of the term “fair,” “fairness,” or “fair play” implies and references such a standard, regardless of its actual existence. So, how does this apply to the detective fiction genre? Well, in citing fair play, the reader of such a work is holding it up to an subjectively felt, though recognized-as-objective standard. And because he recognizes the standard as objective, if he feel the work falls short of it he does not complain that “this is not satisfying to me!” but rather that “this is unfair!” However, unlike with the child, it is not sufficient for the author to reply “No, it’s not!”– not sufficient, that is, for either his sales or his pride. It is important to him that the reader believes that the standard has been met. And that’s where the “rules” of the genre fit in. They are cited to define the standard of fairness, to arbitrate whether a work is fair or unfair. But can they really achieve this? In regard to one aspect of detective fiction, I believe they can. That is the realm of what might be described as “narrative fairness” (not a particularly satisfactory term, but I’ve not been able to come up with a better one). By “narrative fairness” I am simply referring to the question of which techniques the author is or is not allowed to employ in the “telling” of the tale. People may argue about what be the rules should be, but at least regarding this aspect it is possible to establish and cite clear-cut rules. I myself subscribe to Dorothy L. Sayers’ notion in that there is only one thing an author may not do in this respect, and that is to make a false statement “on his own authority.” In other words, a third-person narrator cannot lie. This does not prohibit the author from employing deception– deception by omission, deception by misleading inference, or falsehoods by first person narrators, who, as Sayers reminds us, are “not necessarily the author.” Thus, the Christie’s Murder of Roger Ackroyd is exonerated on several counts (it’s rather stunning how “clean” this once-controversial book is in this regard), while a rarely-questioned work such as Death on the Nile turns out to actually be unfair, based on an extremely minor technicality. A book such as Carr’s Seeing is Believing is admittedly difficult to judge, but that doesn’t affect the rule– the question of whether it plays fair depends upon how one interprets the tricky ambiguities of the English language. Similarly, the narrative fairness of Christie’s A Murder in Announced must based on how we answer the question of whether that which we call ourselves is our true name. Whether these works follow the rule is in question, but the rule itself remains constant. Now, others my argue that narrative fairness consists of more or less than my (or Sayers’) single rule, and I’m not insisting that I’m right about it. I’m just pointing out that that it is possible to define clear-cut criteria for this question, and judge works according to it. But what about the issue of clue sufficiency? Here’s where it all blows up. Let’s look at some of the offered “rules” regarding this question. The first category would be those rules that state “the reader may not be denied any clues granted the detective” or “the reader must have equal opportunity with the detective for solving the mystery” (there are several other versions of this which say the same thing). And that’s fine as far as it goes– I’m sure that most would agree that fairness dictates that the reader is provided with all the clues granted the detective. The problem is, it’s a rule with no minimum standard. For, if that’s all there were to it, a story in which the detective arrives at the solution based on little or no evidence must be deemed fairly-clued, just as long as the reader has been provided with the same sparse or nonexistent evidence. As you can see, that rule really gets us nowhere. Nearly all other clue sufficiency rules consist of variations of the idea that “the reader must be provided with all the clues necessary to solve the case.” This initially appears to be much more useful, until one faces the task of defining or measuring its terms. What is really meant by “all the clues necessary”? Indeed, what does it even mean to “solve the case”? (I can’t help thinking of Robert Benchley’s hilarious “Does the average man get enough sleep? What is ‘enough sleep’? What is ‘the average man’? What is ‘does’?). Seriously, though, what does qualifiy as “solving” a mystery? If a reader has arrives at the solution of mystery thru sheer guesswork or an arbitrary hunch, can he be said to have solved it? If not, does the fact that a reader has employed indications (clues) provided by the author to arrive at the correct solution mean that the he has “solved” the mystery? Suppose that I arrive at the solution that Phillip Latterby was killed by his nephew Nigel based on the fact that Nigel owned the crossbow employed in the commission of the crime, and that Phillip had stated that he planned to disinherit him. Can I be said to have solved the mystery if that turns out to be the correct solution? If so, then what about another reader who decides that the culprit was Phillip’s wife Adeline, who may have stolen the crossbow from Nigel’s’s room (it had been earlier established that she had once been arrested for shoplifting), and whose disagreement with Phillip’s political beliefs was well known? Is this reader less correct than I am, or is he justified in claiming that the author was not “fair,” that he had not provided the reader with “all the clues necessary to solve the mystery”? Again, we are referencing some invisible but objective standard. The question, then, is clearly: how many indications qualify as “enough”? How many constitute “all the clues”? One? Five? 50? Outside of the standard of “some” clueing (which means at least one clue– and I doubt that many would agree that the inclusion of a single clue guarantees that a work is sufficient to be called fairly-clued), there is only one standard of clue sufficiency that can be clearly defined and universally agreed upon as sufficient, and that is the standard of total deductive provability. Now, total deductive provability is a great, solid standard, against which no cries of “unfair” could ever be raised, but unfortunately it entails certain problems in relation to detective fiction, not the least of which is that no works of detective fiction have ever met it! A bold statement, I realize, and one that I certainly can’t back up from personal knowledge– I haven’t read (nearly) all works of detective fiction. There is certainly the possibility that I am wrong about this point. But I have read a great deal of the most lauded works of the genre (all of Christie, most of Carr, Queen, Berkeley, Brand, and several others), and none of what I’ve read (or heard about) suggests that there are any works that qualify. Admittedly, there are occasional works that prove that “x and only x could have committed the crime” (though even these are rarer than it would seem, as the “logic” that “proves” this point is more often than not flawed). However, even those works that do arrive at this point by unassailable deductive logic do not meet the standard, as the solution to the mystery in these books never (in my experience) consists solely of this single point. Rather, the solutions to detective stories (presumably) all consist of a scenario of contentions, some of which may be arrived at deductively, but which are all linked together by abductive reason (inference to the best explanation). This abductive link itself can not be proven, and very often the details it connects (and which subjectively strengthen the credibility of the solution) cannot be deductively proven either. A large category of such details are behavioral discrepancies, clues which very often (in my personal opinion) offer the most fascinating, satisfying and convincing of evidence, and yet which can never be deductively proven. Examples of such behavioral discrepancies are the suddenly heightened volume of Simon Doyle’s voice in Death on the Nile, Avory Hume’s abrupt apparent change in attitude toward Jimmy Amswell in The Judas Window, and the uncharacteristic comportment of the two Generals in Chesterton’s The Sign Of The Broken Sword. The solutions of these stories not only explain these discrepancies, but are made more interesting and convincing by them. The explanations fit in with everything else in the solution, and reinforce the solution’s sense of inevitability. Yet none of them can be deductively proven, as there are countless other possible explanations for these behavioral discrepancies. For instance, Simon Doyle’s sudden vocal volume increase might have been due to the fact that at that moment he felt a sudden surge in pain from his injured leg. Or, he may have suddenly gone deaf in one ear and was attempting to compensate. That such explanations have no clues to support them and do not otherwise bolster the solution is of no importance; the point is that they are no less provable than the more satisfying explanations ultimately given, and in fact no less logically possible. Furthermore, not only are the explanations to behavioral discrepancies unprovable, they in turn prove nothing. Are then works that consist largely or solely of such clues—works that are richly and satisfyingly clued (IMO) and include many of the most lauded works of the genre—“bad” detective stories? Or are they not even detective stories at all? Carr, Van Dine and others call the genre a game, but if these works cannot “play fair” (which, as we’ve seen, is nearly impossible to do), do they not qualify as of the genre? Certainly Christie’s Five Little Pigs and Chesterton’s Father Brown stories (again, for me and others, beautifully and satisfyingly-clued) never strive for anything even remotely approaching total deductive provability (heck, not even partial deductive provability)—are they not legitimately detective stories? Note, moreover, that any (possible) detective story of total deductive provability would also have to exclude motive as part of its solution. After all, due to the impenetrability of the human mind, motive can never be deductively proven. Sure, we might be able to prove that Uncle Phillip threatened to disinherit his nephew Nigel, that Nigel threatened Uncle Phillip (“I’ll kill you before I let you change you will!”)… even that he DID kill him, and shouted afterward “I killed him because he was going to change his will!” But we still cannot prove that that was the reason he killed him. All that we can prove is that he had a strong possible motive. (Though people often refer to a strong possible motive as a motive, only the actual desire to commit a crime [or other action] constitutes an actual motive. Otherwise, any person with a weak possible motive [“I’ve never cared for Australians”] must be deemed to have a motive for, as with the matter of clue sufficiency, there is no way to objectively define the threshold between weak and strong possible motives). And, as I mentioned before, even if we were able to deductively prove all the individual points of a detective story solution (which would be an incredibly tedious and lengthy process), we would still not be able to prove the abductive chain that links them (the cause and effect relationships between them). So then, am I suggesting that the greatest works of the Golden Age masters are all failures? Well, set against the either uselessly vague or virtually unattainable standards of “fair play” I’d say… yes, they are. Now, there’s no doubt that games and games-playing were extremely important to the world of Golden Age Detective Fiction. The people who both wrote and read GA fiction were by and large games-playing people, the type that Anthony Shaffer memorialized with the character of Andrew Wyke in his play Sleuth (though most of them were presumably more likable and kind-hearted than Wyke, of course). Games were indeed all the rage in that era, and it is quite natural that a type of fiction bearing resemblances to games would be appealing to those people who reveled in playing them. Games-playing and GA Detective Fiction undoubtedly fed and fed off each other. But resemblance is not the same thing as identity, and just as singing at a karaoke bar does not constitute a concert, I maintain that a work of detective fiction is fundamentally distinct from a game. Of course, much depends on how one defines the concept of a “game.” There are many definitions out there, some of them admittedly broad enough to include detective fiction, but those definitions are also broad enough to be of no use in resolving the question. For instance, the first definition of a “game” on dictionary.com is “an amusement or pastime.” Well, yes, by that definition, a detective story clearly is a game, but then so is watching The Sound Of Music. That really doesn’t help us, I’d say. One might enjoy or not enjoy The Sound Of Music, but the mere watching of it does not constitute playing a game, and even those who do not like the film wouldn’t claim that is unfair in not giving the viewer sufficient opportunity to “win” (whatever that would mean in this case). So, what both are suggesting (and also corresponding to that second, more specific dictionary definition) is that, more than just a pastime, detective fiction is specifically a competitive match, a battle of wits between the author and the reader. But is it? I’d call attention to several points that illustrate the distinction between this pastime and all other competitive games. I’ll start with my weakest assertion. 1) COMPETITIVE GAMES ARE PLAYED BETWEEN OPPONENTS ACTIVELY COMPETING AGAINST EACH OTHER AND AWARE OF EACH OTHER’S EXISTENCE. As I mentioned, this is the weakest of my assertions, and I don’t expect everyone to agree with it. But when I read the works of Golden Age Masters– who clearly never knew of me or my level of intellect– am I really competing against them? Doesn’t their lack of opportunity to rebut or parry against my moves disqualify it as a competition? And if I’m able to arrive at both the identity of the culprit and the motive of a mystery prior to the author revealing it (as I did with Christie’s The Body In The Library) did I actually outwit them? It would be nice to think of myself of as the man who outwitted Agatha Christie (clearly I’m much more clever than she), but I don’t honestly consider it an valid claim. 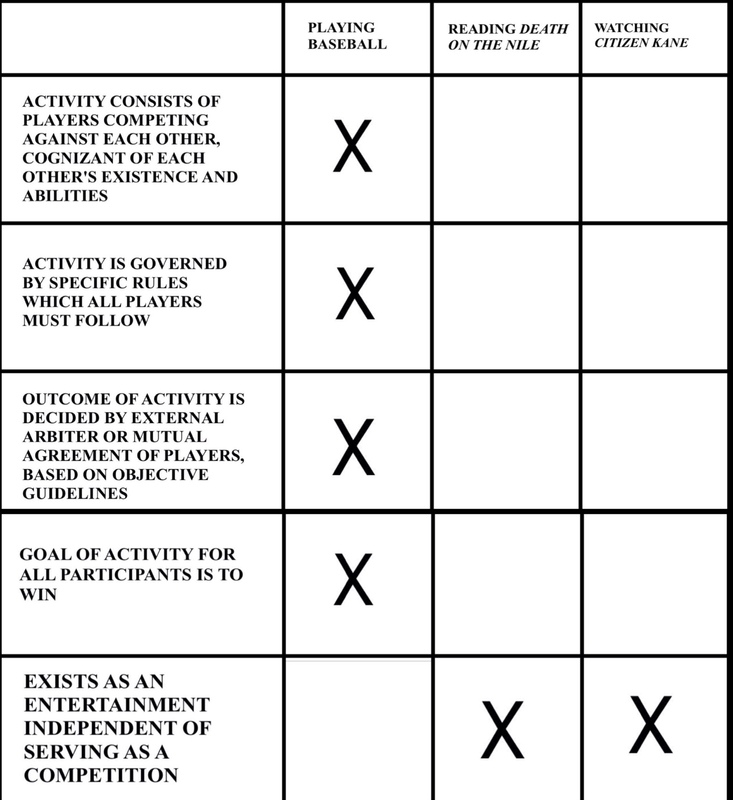 2) PLAYERS OF A GAME COMPETE ACCORDING TO SPECIFIC RULES. I suspect that many who buy into the detective-story-as-game scenario think this one is covered. What about, they may say, the lists of rules set forth by Van Dine, Knox, Gorell, Milne, even Carr? To which I call attention to one monumental point they’re overlooking… the matter of just who these rules are written for! Van Dine’s rules are titled “Twenty Rules For Writing Detective Stories” and, similarly, the rules propose by Knox, Gorell, etc… are all placed upon the writers of the stories. If the detective story is, as proposed, a competitive match between the author and the reader, where are the rules that the reader must follow? To my knowledge, none have ever been suggested, let alone laid down as law. I can only think of one possible rule placed upon the reader, and that is the tacit rule that he mustn’t peek at the end of the book. But whereas the reader may call “foul” at the writer not following the “rules” (whosever’s rules they choose to appeal to), no one is insisting upon (or even mentioning) that the reader must heed the “no-peek” rule– it is both unspoken and self-enforced. What other competitive game lays down rules for players on one side and not on the other? None which I can think, which brings up the next distinction. 3) RESULTS OF A COMPETITIVE MATCH ARE DECIDED EITHER BY MUTUAL ASSENT OF THE PLAYERS (BY REFERENCE TO ESTABLISHED RULES) OR BY AN EXTERNAL ARBITER (ALSO, PRESUMABLY, IN REFERENCE TO ESTABLISHED RULES). This axiom applies to all competitive games, from thumb wrestling to baseball to hopscotch to championship chess. When the players themselves call the decision (as in, say, a card game) it is in reference to a specific set of rules, calling upon such rules to provide an objective arbiter of victory. Other competitions do admittedly have more subjective rulings (e.g. a beauty pageant, a dog show, or a singing competition), but these too are presumably following specific set guidelines and, more importantly, in such cases the judges are not the players themselves but external arbiters. The outcome of the detective fiction “game” is neither decided by mutual assent of the players (J.D. Carr is not there to agree that I outwitted him), nor is there an external judge deciding the outcome (“No, Scott, you did not properly solve this one before Ellery Queen revealed it. I’ll be back next Thursday, and have the check postdated”). No, the outcome of a detective fiction match is decided by a judge solitary, subjective and “of the players”… the reader himself. And what if that reader arrives at a solution he deems superior to the solution subsequently revealed in the book? Was he wrong? Did he “win” or did he “lose”? Who is to make the call? Not only is the reader himself not an objective arbiter, but he has no standards to appeal to other than varying, unstandardized sets of “rules” (we play cards according to Hoyle, but are we playing the detective fiction game according to Van Dine? Knox? Carr?). Further, the most frequent grounds for crying “unfair”– insufficient clueing– has, as we’ve seen above, either no objective standard to appeal to, or else an objective standard that is never met. In essence, only the gut of the reader can decide whether he is victorious, and certainly no other competitive game is decided by the subjective belief of one of the players. 4) PLAYERS COMPETE IN GAMES WITH A DESIRE TO WIN. No doubt, one can enjoy playing a game even if one loses it. And there also unrelated reasons for desiring to lose a game (“If I let her win, she’ll sleep with me, give me the promotion, etc…”). But I can think of no game which many people play actually hoping– for no other ulterior reason– to lose. Yet, there are many, many people (myself included) who would a actually prefer to “lose” the detective fiction “game.” For, if detective fiction were indeed a game, “winning” (for the reader) would consist of correctly arriving at the solution to the mystery prior to it being revealed by the author, and “losing” would mean not anticipating it (or arriving at an incorrect solution). And a substantial portion of the mystery reading public would actually rather be proven wrong, to “lose” under this definition. Why? Because, if the author is able to successfully conceal the truth from them until the moment at which he chooses to reveal it, the reader may experience– in the dramatic way the author intended– a pleasing sense of “sudden retrospective illumination” (or paradigm shift, or epiphany, or in Aristotelian terms, anagnorisis)– that is, the sudden simultaneous sense of surprise and inevitability. If you are not among the people who prefer this sensation to correctly anticipating the answer, I invite you take a survey of fellow mystery readers. I’m not suggesting the that our way of enjoying detective fiction is superior to the other, only that we constitute a substantial portion (perhaps even majority?) of the mystery readership. Of course, many people do try to solve the mystery they are reading, and would rather arrive at the correct solution prior to being given it by the author. It is quite fair to say that these readers are treating the detective story as a game– they are “playing” it as such (serving as their own rule makers and arbiters of success). But there’s a fundamental distinction: a detective story exists as an entertainment independent of its employment as a game– one can actively participate in its function as designed (i.e. one can read it and enjoy it) without anyone treating it as a game. This same is not so of entities designed solely or even primarily as games. Yes, one can enjoy baseball or chess as a spectator, but someone must be playing it as a game in order for anyone at all to enjoy it. Not so of detective fiction. Also note that ultimately any entertainment– not just detective fiction– can be treated by an individual (or even a group) as a game. Even the aforementioned activity of “watching The Sound Of Music” can easily be turned into a drinking game (take a shot every time Gretl cries “Fräulein Maria!”). But this doesn’t mean that The Sound Of Music or the act of watching it is inherently a game. Admittedly, the puzzle provided by a detective story more readily invites its treatment by individuals as a game– that is, they make a game of it for themselves. But as with The Sound Of Music, The ABC Murders can be enjoyed as an entertainment without the reader choosing to treat it as a game. Thus, if we say call detective fiction a game– merely because it can be treated as such– it follows that we must say the same for all types of fiction, and indeed for all types of entertainment. I believe that side-by-side comparison makes it easy to recognize what type of activity detective fiction more closely resembles. One further point (and it is indeed an important one): that element of “sudden retrospective illumination”– a key element of the detective fiction genre, and described by Carr and other genre experts as a euphoric, almost religious experience– is found nowhere in games. One might be surprised by the outcome of a game, but games are not specifically designed to provide an ending that both surprises and seems retrospectively inevitable. It is however, found elsewhere in art, not only in detective fiction, but in other genres as well (e.g. the 1945 romance film Brief Encounter— anything but a murder mystery– concludes with a revisit to the first scene, with a new, more intense audience understanding of the meaning of the events). An interesting case is that of Cluedo (or Clue, as it is known here in the States) which, much as the character in Chesterton’s The Man With Two Beards is described as the reverse of a ghost (“not the antic of the soul freed from the body. It was the antic of the body freed from the soul“), is in several respects the exact opposite of detective fiction: whereas a detective story is a fiction that in some respects resembles a game, CLUEDO is a game that resembles detective fiction. For, despite involving many of the stylistic trappings of the classic Golden Age Detective Story (the Victorian British setting, the stock character types, the genre-common instruments of death), it is indeed a true game which is played by employing strict deductive logic. Moreover its solution offers no sudden retrospective illumination. One might be surprised that Colonel Mustard committed the murder in the conservatory with a lead pipe, but there’s nothing in the game designed to make that scenario seem any less likely than any of the others. Conversely, there’s nothing (in the way of clueing) provided to make one feel, “Of course! I should’ve known! It was there before my eyes all the time!” At the same time, it does provide the true “fair play” which detective fiction cannot. Finally, what is my point in “attacking” the idea that detective fiction is a game and the notion of detective fiction “fair play”? I assure it is not to upset the apple cart, nor is it to spoil the fun. And it is certainly not for the purpose of criticizing or belittling the genre. On the contrary my purpose is rather to glorify the genre… I come not to bury GA Detective Fiction, but to praise it. However, to call the detective story a game merely because some readers think of it as such is actually to do it a disservice. For, while one may admittedly use a shoe to drive a nail into a wall (indeed, I have), to then call a shoe a “hammer”–merely because it can be employed as such– is to call attention to all the ways in which it is inferior to those objects (real hammers) that were designed expressly for that purpose. Similarly, to call the detective story a game both highlights the many ways that detective stories fall short as games, yet overlooks the wonderful pleasures they offer that games cannot. This entry was posted in Uncategorized and tagged A. A. Milne, Agatha Christie, Anthony Berkeley, Anthony Shaffer, Brief Encounter, Christianna Brand, Citizen Kane, Cluedo, Dorothy L. Sayers, Ellery Queen, G. K. Chesterton, Golden Age Mystery, John Dickson Carr, Robert Benchley, Ronald Knox, S. S. Van Dine. Noah, Thank you for posting Scott’s essay. Having been a part of the GAD group for quite a few months now, I have had the opportunity to sample Scott’s arguments in pieces. I think one of the joys of being a part of this group is that we all share a deep abiding passion for this body of work. We come to it from different backgrounds and levels of experience, we have different favorites, different tastes and a wide variety of opinions, both about specific authors and work and even about the nature of the genre. I’ll use Agatha Christie as an example here because I know her better by far than any other author. (Like Scott, I have read all of Queen, Berkeley, and Brand, and I’ve read nearly all of Marsh and about half of Carr – not the Carter Dicksons, which I’m hoping to make up in the future – plus a smattering of dozens of other “fair play” authors.) My first readings of Christie’s oeuvre took place over about fifteen years starting when i was eleven, so I was very young. Still, she was writing books well into my twenties, so I was a fairly mature reader when I first tackled at least some of her novels. The number of solutions I figured out – without guessing but by grasping the significance of at least one major clue – is infinitesimal. I want to say three titles: They Do It With Mirrors, Dumb Witness and Death Comes As the End. I don’t even want to count Dumb Witness because that clue is particularly obvious and clumsy, not really worthy of Christie’s best work. (Ironically, it is a clue that cannot really be interpreted in a variety of ways and therefore reduce the “fair play” aspect of the book. But that brings us to Scott’s analogy with the game of Clue, which is really nothing more than a logic puzzle disguised as a murder mystery, fun to play for the trappings, but not at all satisfying as a whodunnit in the way a good novel is, flaws and all.) Anyway, as a result of finding the solution to these three books, they sink very low down my order of enjoyment of Christie’s books. And that’s because I think that, for some of us at least, the joy of reading a “fair play” mystery is to play the game and LOSE. Just because that’s NOT what you do in baseball or chess doesn’t mean such a game can’t exist! A further point in favor of this argument is that, in a standard game or sport, to desire to lose is considered, at best, wrong-headed and, at worst, cheating. If you throw a game, you are doing this for some reason that has nothing to do with the play of the game itself; perhaps you are in debt to gamblers, or you wish to be forced to retire from the sport professionally so that you can pursue your real passion for community theatre or stamp collecting. But none of us who WANT to lose in the mystery game ever think of THROWING that game! We TRY to win, even though we don’t want to win. In fact, I would suggest that our enjoyment at losing the game is heightened by the degree of effort we expend in trying to win. I recently read The Eleventh Little Indian, that French homage to Christie. I figured out the ending about halfway through. In fact, i grew increasingly impatient with the author for dragging the investigation on and on since, for me, the game was over. And voila! I fell into the author’s trap and was joyfully proven wrong. I remember going, “Hey!” with an immediate sense of having been robbed of something, followed by a euphoric feeling of joy at having been fooled. THAT’S THE GAME OF THE MYSTERY!!! It’s weird, it’s unique, and Scott has shown it’s arguable. But I hold that it is a game nevertheless. As for the fair play element, yes, all authors are human and cannot create the perfect machine. Perfect machines are boring (i.e. Clue) and they tend to go insane and try and kill you anyway (see 2001 or Ex Machina.) Any clue is open for interpretation; logic in a mystery can be rough and even foisted with great force upon a reader. But the summative force of all the facts and clues usually points satisfactorily in one direction, and it’s satisfying enough. The clue that Scott discusses from Death on the Nile is a case in point: sure, there are fifty possible reasons why Simon might raise his voice. However, taken in sum with all the other clues and events that Poirot lays out, this reader is satisfied with the detective’s reading of why Simon yelled. The case is even shakier with Miss Marple, who relies on her intuitive sense and her understanding of human nature based on her endless store of village parallels. In A Body in the Library, the main clue is a fingernail. In one of the books I mentioned above, the clue I latched on was the way a character was breathing heavily. Well, gosh, there could be a million reasons for that fingernail or for why that person breathed heavily. But Miss Marple latched onto the right reason, and she used it as part of a larger patchwork of evidence. I don’t think ANY policeman could convict a person based on the case Miss Marple builds in ANY of her books. Thank God her murderers always fall apart at the end. Poirot is better at amassing evidence. So is Ellery Queen, who laid out something like twenty-five pieces of evidence in the sixty plus page denouement of The French Powder Mystery. Fair play? Maybe not, in terms of the multiple interpretations that one could give to ANY clue. But to this reader? Fair enough. Your description of the joy of reading detective stories is a perfect description of that sensation I describe as “sudden retrospective illumination.” It sounds like both our approach to reading them and our pleasure in them is quite similar. But it’s clearly a matter of subjective satisfaction. I don’t see what it could possibly have to do with an objective standard. And if it isn’t related to an objective standard, what could it possible have to do with fairness? I think there’s little if any meaning to the idea that “The author promises to play fair and to lay out the clues so that the reader has all the information he needs to solve the case” unless we could have any idea of what any of that means. What does it mean to “solve the mystery”? What is “all the information he (the reader) needs”? If we could define what it means to “solve” it, we would still be unable to define what “all the information” needed would consist of. It’s a threshold impossible to define, unless it refers the personal subjective level of sufficiency required by an individual reader to “solve” the mystery (whatever that means). And how could any author fulfill his promise to meet that level if it’s different for every reader? Again, without an objective standard, fairness means nothing. (Further, I still don’t see how that sentence could qualify as a rule for the reader… It calls for an [immeasurable] obligation on the part of the author, but places no imperatives upon the conduct of the reader– I still maintain there are no rules for the reader, and frankly no reason there should be). I quite agree that “the summative force of all the facts and clues usually points satisfactorily in one direction, and it’s satisfying enough.” I doubt I feel any less satisfied by those clues than you do. But I maintain that’s totally unrelated to the concept of fairness. It’s like the question of whether someone is tall enough. I’m generally satisfied with my height. But one could only answer the question “is Scott Ratner tall enough?” if one could first answer the question “tall enough for WHAT?” Without an objective answer to that second question, there are only subjective answers possible for the first. The matter of satisfaction calls for a subjective answer, the matter of fairness for an objective one. Christie’s best stories are very satisfactorily clued, IMO. And I’m not saying they are unfairly clued, I’m saying that the concept is inapplicable. It’s rather like asking if they’re magenta enough. Or tall enough, for that matter. Scott, I know I’ll never change your mind and wouldn’t even want to. I think we hold the concept of “fair play” at a different standard. We may not even define it the same way. I think that, for generations, readers have turned to certain authors because, in addition to being puzzles, scared, amused and delighted, they know that these particular authors are issuing a sort of challenge. I accept that this challenge may never be actually fair at the level of fairness you hold it to. But I know that Ellery Queen wants to hoodwink me and that, whether or not he’s giving me a chance to beat him at that game by the time he issues his “Challenge to the Reader” he still hopes to win and watch my jaw drop. I think that the one reader rule is EXACTLY the one you mentioned: don’t cheat! Don’t look at the end. I HAVE looked at the end before and been very disappointed when I realized that I had missed out on some of that jaw-dropping fun! I’m reading the Ellery Queen letters book right now. It’s very painful to be witness to the neurosis and conflict in Dannay and Lee’s relationship, but it does offer fascinating hints as to their process of clueing and fairness. Lee mentions to Dannay that there was a hole in the logic of the solution to Ten Day’s Wonder that he had to plug up. (Dannay responds by saying “Your letter put me off my dinner. You nauseate me.” Really, one has to take a break from this stuff; they are quite awful to each other.) I think that Queen’s effort – and Carr’s and Christie’s and the rest of the best – WAS to build the most logical, airtight case they could, to be as fair as they could. They were flawed, sometimes things worked out better than others, and even in the best (i.e. Death on the Nile) an astute reader COULD say, “Well, maybe that means something else. Who’s to say I’m wrong?” You asked in your essay if a reader should be dinged in the game for coming up with a better solution. I say, yes, the prize that the author wins (aside from too few bucks) is that her/his solution is the right one! Better one, different ones…doesn’t matter, they lose! That’s part of the game. By the way, I watched Kill a Better Mousetrap. Thank you for sending it to me. I really enjoyed the clever way you wove different Christie techniques in the end, and that laugh about the faked phone call was well deserved. Nice job! I hope you continue to have success with the play. Brad, I’m trying to make it clear that I’m NOT insisting on a high level of fairness. I’m not suggesting that fairness lies at the level of total deductive provability. All I’m insisting on—if we are to discuss the issue of clue sufficiency—is some objectively measurable standard. ANY objectively measurable standard. For without it, the concept of “fairness” has no meaning. We can say “fair enough for me” or “fair enough for you” but unless we can agree upon an objective level of fairness, those phrases are really only references to subjective satisfaction, not fairness. I only cite total objective provability because it is the only measurable standard of fairness I can conceive of above “containing some indication.” Again, I’m perfectly wiling to believe that true fairness lies at a much lower level than that of total deductive provability. Unfortunately, since we have no way to measure that true standard, reference to it makes no sense. All we can do is posit our own subjective sense of satisfaction, and to do that by using the objective term of “fairness” is like arguing the relative attractiveness of Grace Kelly and Audrey Hepburn without recognizing the subjectivity of the issue. But the only reason we even have to deal with the question of “fairness” at all is because of an insistence that it is (essentially and fundamentally) a competitive game. A detective story is a work of fiction. That, I believe is the “table is always a table” aspect of it– both those who employ the story as a game and those who don’t accept it as a work of fiction. Now, I’ll also concur that detective stories differ from other fictional works in their common intent to present a puzzle to the reader. But there is a big, big leap from that to the assertion that is in any way inherently or essentially a competitive game. For, to determine whether whether detective fiction qualifies as a competitive game, we must define what it means to be a competitive game. I attempted to do so by citing the common features of those entities known as competitive games, and detective fiction lacked nearly all of them. Even allowing for the possibility of playing a game against a dead person (and I’m not entirely convinced), I maintain that any activity that people play to lose, has no arbiter of the outcome other than the subjective sense of one of the competitors, has no stated rules for one of the competitors, and rules for the other that no two “rulemakers” have ever agreed upon, are often impossible to clarify or define (“all the clues necessary”), and are not as highly regarded or celebrated as are those instances in which they were broken, does not qualify as a competitive game. It is not simply that detective fiction differs from some other competitive games in some of these respects, it differs from ALL other competitive games in ALL of these respects. Note the function of these elements in competitive games… they are included to ensure fairness! They are there not only to provide objective standards but to clarify them. I believe the best detective stories are great works of fiction that provide puzzle, surprise, and “sudden retrospective illumination.” They are indeed also often employed by individuals as a game- a makeshift game. I say makeshift, because games playing is making something of them which, though their nature invites this activity, they are essentially not. Which explains why they lack those many elements included in true competitive games that are designed to clarify exact standards, eliminate ambiguity, and ensure fairness. And If a competitive game is not define by the elements I suggested, I ask, how is it defined? I freely admit that there are possible definitions of game broad enough to allow for the inclusion of detective fiction, but I am convinced that such definitions would then be too broad to serve the purpose of those who are attempting to define it as such. 2) The facts needed to solve the case will be presented to the reader in order for him to follow the trail and correctly identify the culprit. The competition is between the author and whichever reader WANTS TO PLAY. So you and I don’t count if we follow the trail but want to lose. Neither does the person who doesn’t care who the killer is. For them, the book is an entertainment, nothing more, and there’s NOTHING wrong with that. For you and me, it’s the hope that the climax will provide that “sudden retrospective illumination” that is crack to us! And while it ironic that you and I feel we win the game if we lose because we get to experience SRI, someone else is chomping at the bit to figure out the mystery before the suspects gather for the final time in the drawing room. What you and I will always disagree on is this concept of total deductive provability. I don’t feel it’s necessary for the game to work. You do. We’re at an impasse. I do want to add here that I have been the foreman on a murder trial, which brought home the fact that we have to determine the guilt of a person based NOT on a total belief in his guilt but in a belief beyond a reasonable doubt. Now you have discussed how a game like Clue works better as a game than a novel because of its limited nature and strict rules of play. But neither you nor I enjoy matching wits in Clue the same way we enjoy matching wits with Christianna Brand or Carter Dickson. If we prove that Mrs. Peacock did it with the rope in the library, we get the tiniest frisson of pleasure, ESPECIALLY in comparison to finding out who amongst the villagers of Wychwood has killed eight people (and a bird) and why! But I have to say that, if real life allows a man to be convicted of a crime based on reasonable doubt, then I for one will not hold mystery writers to a higher standard and tell them that they have not successfully created the boundaries of a game. But the point is that you CAN do this! You have stated a very logical argument, and I’ll bet a lot of people would disagree, especially the learned group we have the privilege to interact with here. You and I are just going to have to disagree on this. Also, you can’t fight me anymore because you DARED to suggest there could be a comparison of beauty between Grace Kelly (Rear Window, man, COME ON!!) and Audrey Hepburn (Sabrina? Charade? Are you MAD????) No one should have to choose between these two!!!!! You forfeited your right to argue with me right there! I find it difficult to believe that you’ve read anything I’ve written. No, not a bit, Brad. But you do see what I’m getting at, don’t you? If it is a competitive game, the outcome must be decided by mutual agreement according to agreed upon criteria (impossible here as our opponent is often too dead to agree with us, and no one has ever agreed upon the criteria, anyway) or else by an external arbiter (someone who’s not one of the competitions). That’s the reason that your real-live trial example is inapplicable. True, real-live court cases cannot be proven deductively beyond all mathematical and logical doubt, and thus we deem “reasonable doubt” as sufficient. That is perfectly fine. The point however, is that the decision of what constitutes reasonable is assigned to an “external” arbiter, that is, one (hopefully) uninterested– a judge or a jury. To make the “reasonable doubt” concept analogous to reading a detective story, we would have to imagine a society that accepted a verdict merely because it was deemed reasonable by either the defense or the prosecution. Brad, thanks for watching Kill A Better Mousetrap and for your kind words about it. I’m glad you enjoyed it. As for “fair play” I think you’re right, we’re evidently dealing with different definitions. I spent the first several paragraphs of my essay trying to get across the idea that people (even as children) always use the term fair to refer to an exact, objective standard. It’s a lightswitch term– one of those “a little pregnant” concepts. People may use the terms “more fair” or “less fair” to suggest moving closer or further or closer to that standard, but until something reaches that standard it is not fair, and once it does it is fair. It either or is it isn’t. Now, it’s not that I hold a higher standard– I’m not suggesting that fairness requires total deductive probability– it’s just that total deductive probability is the only MEASURABLE objective standard above that of “some indication” (which means simply more than “no indication”). Thus, unless “all the clues necessary” means “at least one clue” (which I doubt anyone would consider sufficient as “all the clues necessary”), the only standard we can measure is total deductive provability, which I consider a rather tall and ridiculous order. Thus, the phrase “all the clues necessary,” being undefinable, serves no practical purpose. It’s important to note that none of this has anything to do with levels of satisfaction. I suspect our tastes and standards of satisfaction are similar in regard to whodunits. I find the greatest Christie, Carr, and Queen works eminently satisfactory in regards to clueing. But whether they objectively contain “all the clues necessary” or are objectively “fair” has absolutely nothing to do with our levels of satisfaction, and I believe we have no way of knowing, unless we could understand what that objective standard is. It’s like the question “is Scott Ratner objectively tall enough?” We have insufficient information to answer that question, as we don’t know what qualifies as “objectively tall enough.” My objection, then, is to employing the objective term (fair) to refer to the subjective concept (satisfaction). My point about the difference between the genre and the game is best illustrated by the example I mentioned to Ho-Ling: the distinction between a table and a table being used as a chair. One may sit on a table and thus, in a sense, make it a chair. But does that mean that a table that has never been sat on still inherently a chair? Is an elephant (a bookshelf, an automobile, my aunt, etc..– all of which can be sat upon) inherently a chair? I say no, and even when used as such, because they were not primarily designed as such, they are not entirely as well suited to the purpose. Cluedo and baseball are always games. Take away their use as a game and they serve no function. But it is important to keep in mind that a detective novel exists as an entity (like the table, bookshelf, my aunt) without its employment as a game– and is used by many people for that function, as a story to read, to be surprised and satisfied by (and to bask in sudden retrospective illumination) , but not to be played. A chair does not have to be treated as a chair to be a chair. But a detective story, which has a totally sufficient function without being treated as a game, therefore has to be treated as one to “be” one. Because it has a function prior to and separate from its use as a game, it is is no more inherently one than a table is inherently a chair. And the many distinctions I made between detective fiction and other entities we know as games reveal the many ways it is not only unique but also, yes, inferior to them for that purpose. After all, there would not be explicit objective rules and arbiters for all other games if those features were not an asset to their function as games. Now, I’m not suggesting that “crime solving” could never become an Olympic sport but, believe me, if it ever did, it would then certainly gain a great deal of verifiable standards and regulations (and not regulations that people would celebrate and admire the breaking of– as were the Golden Age rules). The subjective sense of triumph on the part of one player– his own claim that he won– would not qualify him for a medal. On the other hand, I doubt that an Olympic “Crime Solving” competition would feature “sudden retrospective illumination” a glorious quality that detective fiction provides that I doubt anything that is designed essentially or primarily as a game can. I meant to write “total deductive PROVABILITY” in all places above. I never meant to type probability anywhere. Scott, in answer to your furniture analogy, I would like to quote one of the classic philosophers – Burt Bacharach: “A chair is still a chair, even when there’s no one sitting there.” I would suggest that a table is a table, whether you sit AT it or sit ON it. It may SERVE as a chair, but it’s still physically a table. As for the question of whether Brad is tall enough….bullies insisted for years that this was not true, leading to an agreement between them and Brad’s inner psyche, which in turn has led to years of therapy. Coupled with the fact that, over the last few years, I seem to have started SHRINKING…..well, you can see why I might shy away from that whole argument. A couple of years back, I was member of a Japanese university student club for fans of detective fiction and we often did the “whodunit” game there, which is a form of the detective story much closer to traditional games. Basically, one author wrote the first part of a whodunit story, which always ended with a Challenge to the Reader. Participants then had to solve the case and if you thought you know who it was, you would go discuss your solution (+ logical explanation based on the clues in the text) to the author, who would say whether you were wrong or right. The game was thus always a direct competition between the author and the participant, but also between the participants themselves (usually twenty people or so) (and usually also against the clock). Unwritten rules (which were sometimes written down anyway) were simple: there is always only one culprit, nobody (including the narrator) tells a lie (intentionally), except for the murderer, nothing ‘outside’ the story exists (unless hinted at), and everyone had to take the most logical (‘best’) actions. The sessions always concluded with after-game-discussions about what was good and what could be improved (i.e. ‘fairness’, room for multiple interpretations), so it was really like a ‘normal’ game. A significant number of club members have become professional mystery writers the last 30 years (of the classic puzzle plot school) and they usually still stick to the rules of the game they played as a student, so with these writers, the ‘game’ element can be felt quite clearly in their stories (some of these whodunit stories have always been rewritten and published). Ho-Ling, that does indeed sound like a true game, with fairly rigidly set rules (including those set upon the non-author participants, such as a time limit), participants cognizant of each other, and a true desire to win. It still has the difficulty of immeasurable standards (it is still impossible to define what “all the clue necessary consists of), but at least there are arbiters (perhaps group consensus in reference to the ever-increasingly clarified rules?) to decide such issues. I wonder– if the group believes that a participant’s theory fits the evidence better than the author’s solution, who was deemed the winner? The difference between such a game and a detective novel for me is the difference between a chair and a table which is being used as a chair. Someone can treat a table as a chair by sitting on it, but it has its own function separate and prior to that use, whereas no one has to treat a chair as a chair for it to be one. Though a detective story may be indeed treated as a game (though, as I noted, an extreme unique and atypical type of game), it can be experienced as an entertainment that is not a game (some people read these works of fiction without any effort to “solve” the mystery– whatever that means anyway). To say that a detective novel is inherently a game strikes me as no different than calling a table inherently a chair– and though I derive more satisfaction from reading mystery novels than I do playing games, I believe that tables are more effective and suitable as chairs than detective novels are as games. The best mysteries (not just by the Queens but by the whole cadre of writers that Martin, Curtis and others in here speak about with such expertise) are more than games of course! They are literature. The GAD books have a playful element, like a game. But we read them for more than the puzzle and the clues. We enjoy the characters, the suspense of a web begin woven, trapping them in this investigation, the relationship between suspect and victim, between detective and killer, the representation of an earlier time when closed circle mysteries were theoretically possible and the relative primitivism of scientific technology meant that a sleuth really had to use his little grey cells to solve the case. I own all the Dennis Wheatley crime dossiers, and it’s fun to examine the maps and lists and to pull out the physical clues from their little envelopes……..for about fifteen minutes. Then the dreariness of each crime and the wooden lifelessness of each character starts to become apparent and you realize that you are missing so much from the books you’ve read. You’re missing the emotional glue that binds the characters and the clues, the commentary on the times that each author inserts to some degree, the flavor of the writer’s voice. We who REALLY love mysteries read them for all of this as much as for finding out who stabbed Roger Ackroyd and why. But, oh! Don’t we get a real thrill when we find out the answer to THAT question and that we were so very wrong to suspect the major!!! THAT’S the game!